With the powerful swing of a golf club and the history behind this tropical Mexico paradise, Flamingos Nayarit is one of the most prosperous destinations on Mexico’s Pacific Coast. A favorite destination among avid golfers from around the world, Flamingos Nayarit guarantees vacationing golfers and their families the ultimate in rest and entertainment. Come vacation in Flamingos Nayarit. Here you will appreciate the many exotic aquatic bird species in the area as you parasail, glide across the Pacific Ocean waves in a kayak, or pamper yourself in a spa, cloaked in tranquility. Flamingos Nayarit is an ideal Mexican vacation destination for families and young people eager to enjoy a much-deserved holiday, as well as for couples seeking a romantic refuge. Flamingos Nayarit is the perfect sit back and relax or explore the wonders of a tropical paradise without sacrificing comfort and fun. Flamingos Nayarit Mexico is located in a natural refuge surrounded by the La Vejiga, El Quelele, and La Cortada lagoons. These natural bodies of water are home to a wide variety of aquatic bird species including white herons. Flamingos Nayarit is also the preferred resting stopover for many species of migratory birds and the ideal location for Nayarit bird watching. If you wish to explore the natural wonders of Flamingos Nayarit or appreciate the diversity of flora and fauna that abound in this destination, be sure to take one of the many eco-tours. There are many boat tours down the nine kilometers (six miles) of canals and waterways that cut through the region. On your Mexican getaway to Flamingos you will appreciate beautiful birds in the treetops, turtles walking languidly along the banks of the canal, iguanas sunbathing, and curious crabs emerging from their hideouts. Of course, we mustn’t forget the impressive reptiles that can be seen in some of the crocodile ponds near the beaches of Flamingos, Riviera Nayarit. Upon entering this paradise on Earth, you will have the sensation of being transported back in time. Many of these impressive hotels with façades resemble Mediterranean palaces, complete with attentive staff waiting anxiously to serve you. 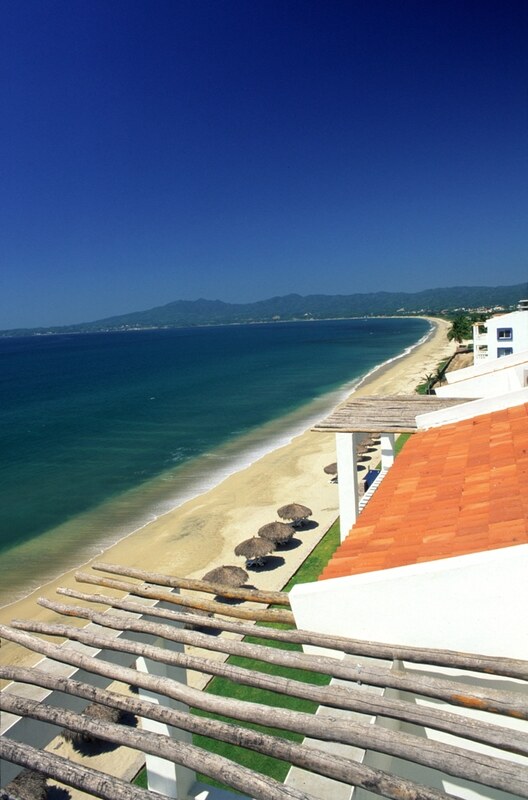 Resorts and hotels in Flamingos Nayarit are the epitome of luxury on Mexico’s Pacific coastline. Choose from luxurious Flamingos all inclusive resorts, quaint seashore bungalow motels, and small oceanfront boutique hotels. There’s something for everyone, whether it’s upscale lavish accommodations or authentic Mexican Hacienda style hospitality. Dive into the endless pools with your family, pamper yourself with a much-deserved spa treatment, or simply rest as the warm rays of the tropical sun gently envelop you. When dusk falls, soak in the colorful display of the sun dipping below the horizon, or enjoy a delicious dinner in one of the many elegant hotel restaurants. Flamingos Nayarit is home to the first golf course established in beautiful Banderas Bay, thus making it one of the most important golfing destinations in all of Mexico. Surrounded by natural estuaries and almost two thousand palm trees, the 71-par, Percy Clifford designed Flamingos golf course is comprised of 18 holes set along more than 6,000 meters (19,685 feet) of hilly land, covered in Tif Ward grass. Avid golfers will delight in the course’s nine water hazards, 43 sand traps, and a 230-yard putting green and driving range. This Nayarit Mexico golf course provides the perfect conditions allowing golfers to practice their best shots in a marvelous tropical environment. 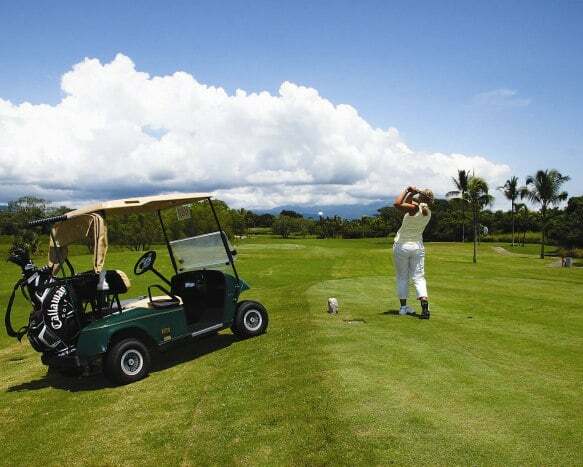 And just like the other fine golf courses of the Riviera Nayarit, the Los Flamingos golf course has hosted important international golf tournaments, which have established this region of Mexico as a world-class golfing destination. The Flamingos Nayarit area is known for combining the golf course designs of important golf pros with the charms of the Pacific Ocean and the green tropical mountains. On the fine, golden Pacific Coast sand of Flamingos beach, which stretches almost three kilometers (two miles), it is common to see small children building sand castles or adventurous tourists floating across the sky in colorful parasails. This is the ideal destination for those people seeking a fantastic Mexico vacation filled with relaxation, whether in the company of friends, family, or a significant other. And, due to its close proximity to Nuevo Vallarta, Flamingos enjoys important real estate development. Flamingos is positioned as an ideal place to acquire a beachfront home or a condominium in Mexico. Invest in Mexico real estate in one of the most sophisticated complexes set along the Pacific Nayarit shoreline. Flamingos Nayarit Mexico is a tropical paradise that, with continued investment, is becoming one of the country’s most prosperous beach vacation destinations. Rest assured your vacation in Flamingos Riviera Nayarit Mexico will be unforgettable! Make your reservations today to vacation in Flamingos Nayarit!